Details and specifications of Translation Experts's NeuroTran, £119 (GBP inc VAT). Quick accurate translation of web pages, e-mail, faxes, memos, manuals, reports, spreadsheets, correspondence, letters to and from a foreign language. Over 100 supported translation languages including: English to & from German, French, Spanish, Hungarian, Polish, Croatian, Bosnian and Serbian. Runs under Windows and Apple MAC and included Microsoft Windows 7 & Vista compatibility. Buy now or call us on 0844 808 3699. See other translation software or products from Ectaco-LingvoSoft, LEC, LingvoSoft and Systran. Quickly and accurately translates web pages, e-mail, faxes, memos, manuals, reports, spreadsheets, correspondence, letters and more to and from a foreign language. Accurately translates complex documents in seconds! You can translate a sentence per second, a simple document in a few minutes or a 250 page book in an hour! Supported languages: English, German, French, Spanish, Hungarian, Polish, Croatian, Bosnian and Serbian. NeuroTran runs on: Windows 7/Vista/XP/Me/2000/NT/98, Apple Mac OS 8,9,X and Linux. Afrikaans, Albanian, Algerian, Arabic, Baluchi, Basque, Belarusian, Bengali, Bosnian, Bulgarian, Catalan, Cebuano, Chechen, Chinese, Chinese (Cantonese), Chinese (Simplified), Chinese (Traditional), Croatian, Czech, Danish, Dravidian, Dutch, Esperanto, Estonian, Finnish, Flemish, French, Frisian, Gaelic (Irish), Galego, Galician, Georgian, German, Greek, Greek (Bible/Classical/Ancient), Hawaiian, Hebrew, Hebrew (Bible/Classical/Ancient), Hindi, Hindustani, Hungarian, Icelandic, Ilongo, Indo-Aryan, Indonesian (Malay), Italian, Japanese, Jeypore dialects, Kashmiri, Khmer, Korean, Latin, Latvian, Lithuanian, Lushai, Maltese, Maori, Marathi, Nepali, Norwegian, Old Church Slavonic, Pali, Papiamento, Persian (Farsi), Persian (Pahlavi), Polish, Portuguese (Brazilian), Portuguese (European), Romanian, Russian, Sanskrit, Serbian (Cyrillic & Latin script), Slovak, Slovenian, Spanish, Spanish (Latin American), Swahili, Swedish, Tagalog (Filipino), Tamil, Telugu, Thai, Turkish, Ukrainian, Urdu, Uyghur, Vietnamese, Welsh, Yiddish. 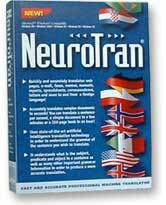 NeuroTran® is a high end translation product. It translates sentence-by-sentence by using advanced artificial intelligence rules. NeuroTran® understands what the subject, predicate and object are in a sentence. Based on this and other important information it inflects translations properly and rearranges word order in the translated, text as well as chooses an appropriate translation for any given word based on the type of text being translated. For non-Western languages (e.g. Japanese, Chinese, Korean, Russian, etc.) requiring characters not included in the standard Windows ANSI code page you need to have Windows® 2000 or XP. Windows® 2000 contains all the fonts and input method editors you need to work with any foreign character set. For individuals and companies requiring a more sophisticated software translation tool NeuroTran® is the answer. NeuroTran® is a successor of InteractiveTran™ and WordTran. Compared to InteractiveTran™ it is smart and will enable users a much higher degree of accuracy during translation. Of course, this product is priced somewhat higher than InteractiveTran™ because of its added functionality. Albanian, Bosnian, Brazilian Portuguese, Bulgarian, Chinese, Czech, Danish, Dutch, English, European Portuguese, Filipino/Philipino/Tagalog, Finnish, Flemish, Greek, Hindi (transliteration), Icelandic, Italian, Japanese, Korean, Norwegian, Rumanian/Romanian, Russian, Serbian, Slovenian, Swedish, Turkish, Ukrainian, Vietnamese, Welsh.